One of the first really Danish foods I fell in love with was flæskesteg. Flæskesteg translates simply to pork roast, so there isn’t anything particularly crazy about it, but the Danes leave the skin on the cut so you get an incredibly yummy, crispy pork rind with every slice. I like pig, and I like crispy pig. Sold! Anyway, it isn’t surprising that it was one of the first Danish meals I wanted to learn to cook. I cracked open my Claus Meyer Almanak cookbook to see what he had for me and he had yummy yumminess awaiting. (By the way, he is like the Danish food god and Almanak is one of the Danish food bibles.) I made Sommerflæskesteg med nye kartofler (Summer pork roast with new potatoes) and it really was great. 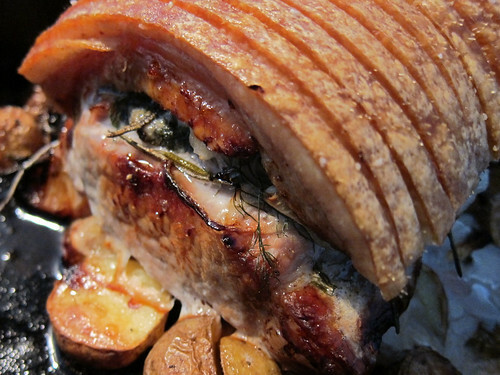 It is a classic flæskesteg, but stuffed with herbs and lemon. This is the kind of thing that you could make anywhere, although getting a cut with the skin on is not so common. 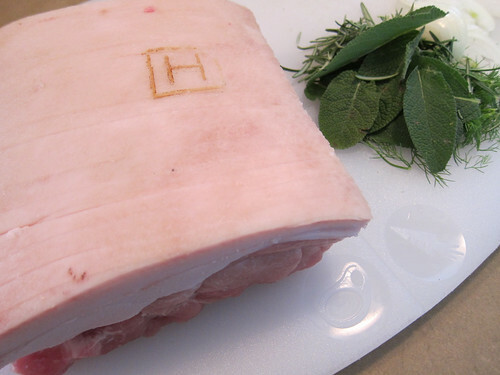 The cut that I used here in Denmark was a svinekam (pork loin) with the skin left on and fine slices cut into the skin. In Denmark that’s eveywhere, in other places you may need to get an actual butcher if you want the skin on. Of course, you can make the dish without the skin, but to my mind it is a horrible shadow of itself with no crispy skin. 😉 Here is the cut I used (along with the herbs waiting to go inside). Regular flæskesteg is not stuffed with anything, but for this one, we slice it open under the fat layer and pile in a bunch of herbs and lemon zest. Then once it is stuffed with yummy, you tie it up and salt the rind. You make a bed of new potatoes, herbs and lemon wedges for the roast to sit on, and pop it all in the oven. After a little over an hour (and a check with the meat thermometer) you have a gorgeous flæskesteg and great, browned potatoes. Pull the meat off the bed to let it sit before slicing and toss some spinach and thinly sliced fennel on the hot potatoes. Slicing flæskesteg is a matter of following the lines, which gives you nice thin slices and every piece with a crispy rind. Super simple and dinner is served. Here is my attempt at a translation from the Danish. Peel the onion and slice it thinly. Wash the herbs, dry them well, and pluck the leaves from the stems (holding on to the stems to lay under the roast). Cut through the middle of the roast and leave just enough on one side to keep it together. Open the roast and fill it with the onions, herbs, fine lemon zest, salt and pepper. Close the roast and tie it with cooking twine so that it is held together well. I also salted the rind since that is classically what is done to flæskesteg. Scrub the potatoes, half them, and put them in a roasting pan. Mix the potatoes with the herb stalks, the lemon cut into quarters, rapeseed oil, salt and pepper. Place the roast on top of the potatoes and put the pan in the oven. Roast the loin at 180C (360F) for 65-70 minutes, until the skin is crisp and the potatoes are golden, tender and crispy. Check the internal temperature of the meat with a meat thermometer and make sure it is 65C (150F). Take the pan out of the oven and set the roast aside to sit for 5-10 minutes. Wash the spinach well and let them drain well in a sieve. Cut the fennel into fine strips. Mix the spinach and fennel into the potatoes so that they get heated some, but still retain their freshness. Slice the roast and serve with the potatoes.